We Designed the MDR with maximum mobility in mind. While other rifles like the MK18 had to sacrifice power in order to be more compact, we had a different idea in mind. What were the primary factors we focused on when designing a rifle with increased mobility, without sacrificing power? 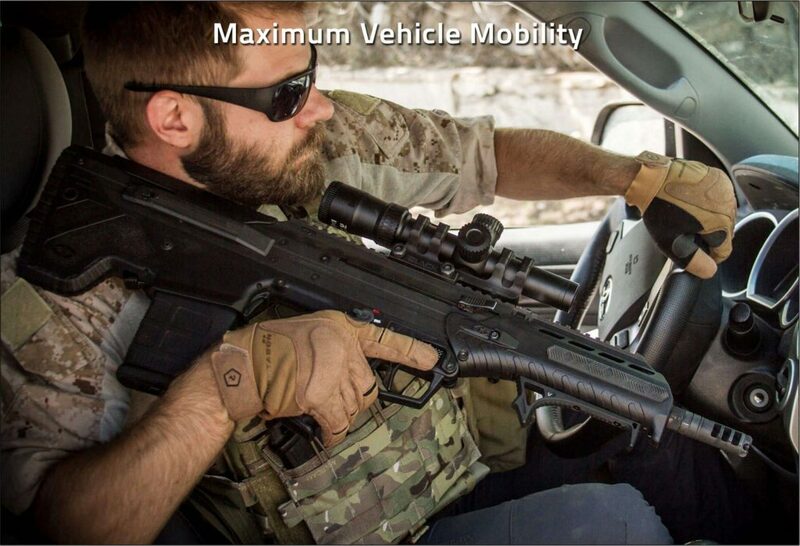 The mobility starts with the size and weight of the gun, making it as short as possible. If you have a long gun it’s much more difficult to maneuver around corners, especially through CQB environments or a tight vehicle. As we worked with special force operators we observed their actions with traditional rifles. As they would approach a corner the operator would put the stock of the gun up on their shoulder, in order to bypass the tight spacing. They then were forced to line their eye up at an angled orientation to quickly engage an enemy in the room. With the MDR this is not necessary. You aren’t forced to adapt the rifle to the environment, you can come through in standard aiming position. 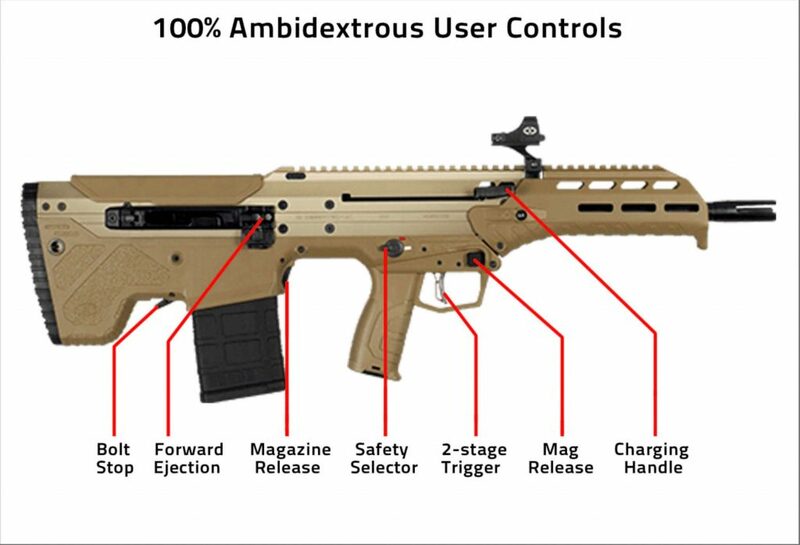 There are a lot of common misconceptions about bullpups that people have, such as being slow, bad controls & triggers, etc. 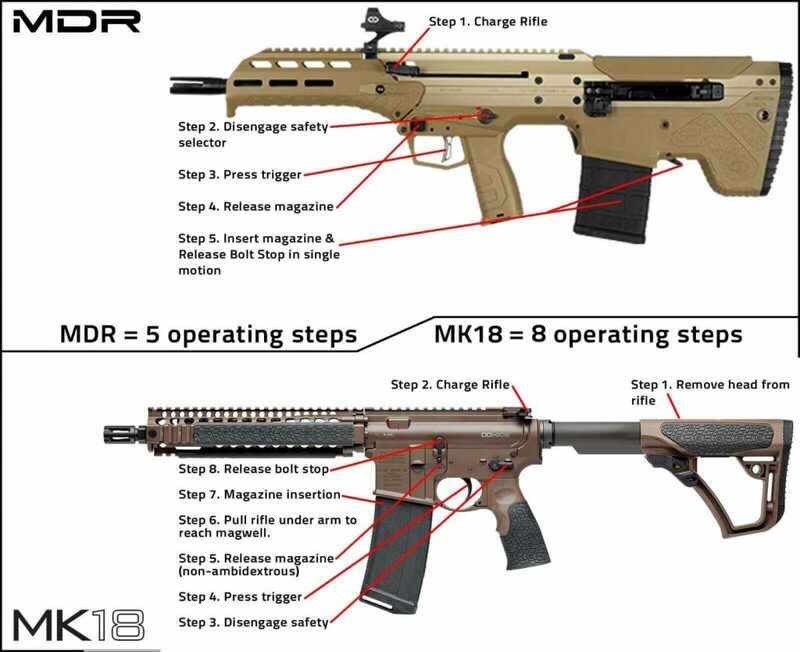 While making the MDR we didn’t want to just address those ideas, but sought to create a rifle that was faster than a standard M16. We did this by analyzing the amount of body motions required to operate the rifle. You can look at this and say “Well, that’s great that you eliminated those 2 steps, but what does this actually look like on the range?”. This same SF instructor mentioned before performed magazine changes with the MDR, just to see how fast he could get the mag change accomplished. This consisted of him firing a shot, dropping the mag, inserting the next mag, and firing another shot. How fast was he able to do this? His fastest time was 1.3 seconds, with an easy average of 1.5 seconds. We validated the 1.5 reload speed by testing it with multiple operators, giving them 15-20 min to start practicing mag changes with a new rifle they’d not been exposed to before. If you’re coming out of a vehicle with an MDR, it will be much faster than you would with something like a full length M4. Transition speed is also improved, due to the MDR being 100% ambidextrous, with a patented forward ejection system. The FES throws the brass forward, allowing you to shoot left or right handed on the fly. While we were looking into the ergonomic design of the MDR, one of the key factors we wanted to see was balance in the rifle. We’ve had a lot of people, after receiving their rifles, put videos where they’re shooting one-handed, engaging targets at 100-200 yards offhand using a .308. We challenge anybody to accomplish this with a traditional .308. We think you’ll find it’s too barrel heavy and unbalanced. At Desert Tech we have a lot of experience with precision rifles. We found that as you shoot with a magnified optic in each position your eye relief box behind the scope changes, depending on the contour of the buttpad. If you’re aiming in an offhand position, the rifle is going to be higher on your shoulder. As you go down into a prone position and aim the rifle up, it’s on top of your shoulder. If you have someone with shorter arms they can actually ride the rifle a little higher on their shoulder, reducing the length of pull. This goes the other way for someone taller, allowing them to ride the rifle lower on their shoulder, extending their length of pull. Our pistol grip has quite a shallow angle of 14 degrees on the MDR. We’re asked frequently why we didn’t put the standard M16 pistol grip on, allowing for aftermarket accessories. I had some pretty bad experiences with other AR rifles. When I would be shooting a gun that was fully decked out, it would end up weighing about 12-13 lbs. With this extra weight on the rifle the recoil would wiggle the screw loose on the grip, so there was the repetitive task of tightening the screw every time I had a shooting session. To counter this problem on the Desert Tech MDR we created a contact rib, which carries the weight of the impact force, rather than the screw. The pistol grips on traditional AR rifles were simply too steep and uncomfortable to hold. We found that a more vertically oriented grip was much more comfortable to hold. The final part of Ergonomics is the ambidextrous controls the MDR offers. All of the controls are on both the left and the right side of the rifle. 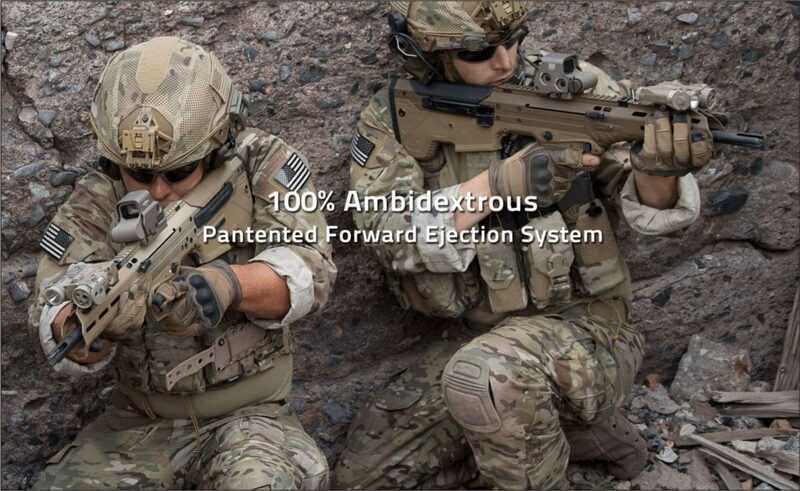 This is possible because of the Forward Ejection System we’ve designed to quickly be able to swap the brass ejection from one side to the other, without any tools. Through the years we’ve spent thoroughly analyzing and improving this rifle. We believe it to be the most versatile and well thought out bullpup rifle on the market. We hope you enjoyed this article on our mission in making the MDR reach Maximum Mobility.